How do we know the Operation Reinhard camps were extermination camps and not transit camps? The Operation Reinhard death camps of Treblinka, Sobibor, and Belzec were not extermination camps. These camps were just transit camps where the Nazis processed Jews for transport to the East as forced labor. Nazi documents show that Treblinka, Belzec, and Sobibor were extermination camps. At these camps, the Nazis and their collaborators murdered some 1,400,000 Jews from all across Europe. The Reichsbahn (Nazi German railway system) was one of the largest organizations in Nazi Germany. In 1942 it employed 900,000 workers and 500,000 civil servants, who managed 850,000 freight cars every day. The entire railway system was controlled from Berlin with three regional offices, many sub-regional offices, and a vast number of local railway stations across Europe. The complicated arrangements for deportation trains began in Berlin and required the coordination of several departments. The rolling stock—locomotives, boxcars, and passenger cars—had to be requisitioned and assembled into trains. The timetables had to be to the minute. Regional offices and local stations along the route to the final destination had to be informed. The trains also needed police to guard them. Police escorts—one officer and at least 12 men—were comprised of either Germans or collaborating militiamen from the lands where the transports crossed. Paper trails followed the men formally assigned to guard trains on their journey. 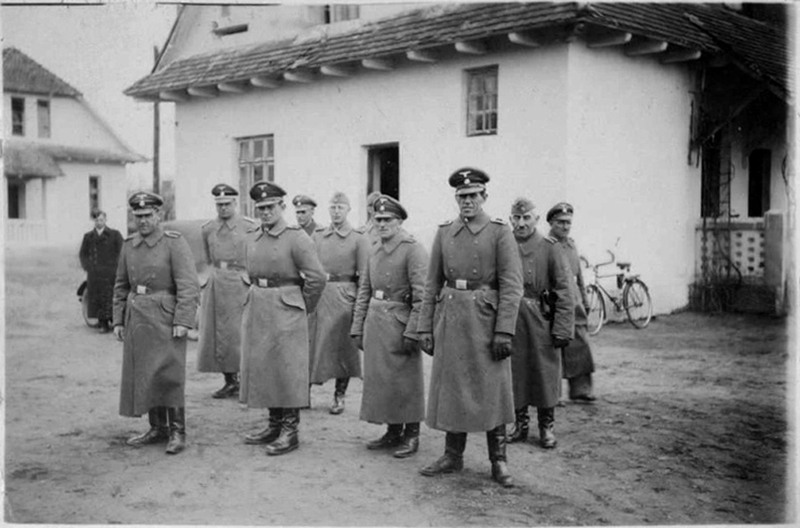 Nazi German guards who accompanied a train also usually sent reports to Berlin about the trip. Some of our evidence of mass murder comes from these sources of bureaucratic red tape. What we know about the transports to the Operation Reinhard camps? From July 27, 1942: A letter from Transport Ministry Secretary Albert Ganzenmüller to Karl Wolff, chief of Himmler’s personal staff. The letter notes: “Since July 22, a train load of 5,000 Jews has departed daily from Warsaw via Malkinia to Treblinka, and in addition a train load of 5,000 Jews has left Przemysl twice a week for Belzec…” There are no documents or addenda stating any further locations where the Nazis might send anyone. 2 trains daily from the Warsaw district to Treblinka. 1 train daily from the Radom district to Treblinka. 1 train daily from the Cracow district to Belzec. 1 train daily from the Lvov district to Belzec. 1 train daily from Radom district to Sobibor. 1 train daily from the north Zullon district to Belzec. 1 train daily from the central Lublin district to Sobibor. There is no mention of further transports from these places to the East. These documents show that Nazi transportation officials saw Treblinka, Sobibor, and Belzec as the end of the line for Jewish deportees. Even more damning, a document entitled “German Reich Railways,” with a subheading of “Special trains for resettlers,” listed transports from January 13 to February 28, 1943. The transports in question went to Auschwitz and Treblinka, among several other ghettos and camps. The document lists the date, the special train code, place of origin, time of departure, destination, and time of arrival. The list contains five transports from Bialystok, Poland to Treblinka from February 9-13, 1943. Each day, a train was scheduled to leave Bialystok at 9:00 a.m. and arrive at Treblinka at 12:10 p.m. After being unloaded and cleaned, the train left Treblinka about eight hours later and returned to Bialystok by 1:30 a.m. The same train was used again for the next day’s 9:00 a.m. transport. Like the other primary documents, none of the documents on the trains from Bialystok to Treblinka mention anything about transporting Jews any further east than this destination. Instead, the trains made repeated trips only between Bialystok and Treblinka during that time—leaving full and returning empty. It is also important to note that sending deportees from Bialystok to Treblinka is actually sending them west, not east. In other words, the Nazis were sending Jews to a location in the opposite direction of supposed resettlement. Bialystok was on the border of German-occupied Soviet territory. If resettlement or forced labor further east was at stake, it was much easier to send the Jews of Bialystok east directly from that city itself. The Jews from Bialystok were going in the wrong direction, contrary to what Holocaust deniers say. These transports headed toward the heart of Poland because the Nazis placed a conveniently located killing site there. Another document from March 26, 1943: A railway time table headed “Transportation Schedule No. 567” detailed a “special train” transporting 2,000 Jewish “resettlers.” The destination was, again, Treblinka. For the Jews on these transports, there was nowhere farther east than that location. As mentioned above, many transports containing Jews from Minsk, Vilna, Lvov, Hrubieszow, Stanislawow, and Zamosc (just to mention a few towns) traveled west, heading for specific locations in the Polish interior. Cities like Minsk, Vilna, Lvov, Hrubieszow, Stanislawow, and Zamosc were already on the border of territories once held by the Soviet Union. When the Nazis could have easily sent the Jews of these cities just a few miles further east, in order to reach former Soviet territory, the Nazis instead transported them westward by train, sending them a hundred miles or more back into the heart of Poland. Jürgen Stroop, the SS general who quelled the Warsaw Jewish uprising (April 1943), sent a series of detailed daily reports to Berlin. On May 24, 1943, he sent his final report, in which he added up his successes in the liquidation of the Warsaw ghetto. He claimed:“Of the total 56,065 Jews apprehended, about 7,000 were destroyed directly in the course of the grand operation in the former Jewish quarter. 6,929 Jews were destroyed via transport to T II, making the total number of Jews destroyed 13,929. In addition to this figure of 56,065, an estimated 5,000 to 6,000 Jews were destroyed in explosions or fire.” By saying “Jews…destroyed via transport to T II,” Stroop is signaling that almost 7,000 Jews from the uprising were killed at Treblinka, designated by code as‘T II’. It is clear that the Jews who Stroop sent to Treblinka were “destroyed”; they were not transported further east. There is no testimony from German perpetrators, Jewish survivors, and local bystanders suggesting that the Nazis sent Jews further east once they stepped foot in the Operation Reinhard camps. No trace of some 1,400,000 Jews who were allegedly sent to the Soviet Union has ever been found. Where were they sheltered? How were they fed? Were camps built for them? Were they forced into ghettos or thrust into contact with local populations? Why would they not need the things the Nazis stole from them to survive and/or work—their clothing, eye-glasses, and other necessary belongings? Not one single document or one single Russian citizen has spoken about the resettlement of some 1,400,000 naked, destitute Jews—including over a hundred thousand Jews from countries in Western Europe and Central Europe. Jews from countries like France, the Netherlands, and Germany would have constituted a sizable (and noticeable) sub-community; many of them would have been quite distinct from the surrounding Eastern European Slavic populations, differentiated both linguistically and culturally. No report of such a thing exists. By comparison, in fall of 1938 the Nazis expelled some 17,000 Polish Jews living within the Reich’s borders. These expelled Jews, having had their citizenship rejected by the Polish government as well, lived in a no man’s land on the Polish border. They took refuge in nearby Polish border towns or hastily established refugee camps. The forced migration and forced resettlement of Polish Jews from Germany had thousands of eyewitness, including journalists, Polish locals, the Polish Jews themselves, government officials, international aid organizations, police forces, and more. Though war certainly obscures communication, it is still an absolute impossibility that over a million supposedly relocated Jews, as Holocaust deniers claim, would produce no firm documentation, no verifiable news report, and no eyewitnesses (from locals or from Jews themselves). The assertion of deniers—that Treblinka, Belzec, and Sobibor were transit camps, where the Nazis processed Jews for labor camps deeper in the Soviet Union—is false. The paperwork of the Nazis themselves shows that they saw these camps as a “final destination” for the Jews sent there. The idea that the Nazis relocated a million Jews to the Soviet Union is an absolute fiction of the highest degree. Mark Weber and Andrew Allen, “Wartime Aerial Photos of Treblinka Cast New Doubt on “Death Camp” Claims” at http://www.ihr.org/jhr/v12/v12p133_Allen.html. Raul Hilberg, The Destruction of the European Jews, Volume II (Holmes & Meier, 1985), pp. 411-416. Yitzhak Arad, Belzec, Sobibor, Treblinka: The Operation Reinhard Death Camps (Indiana University Press, 1987), p. 145. Raul Hilberg, The Destruction of the European Jews, Volume II (Holmes & Meier, 1985), p. 416. Yitzhak Arad, Belzec, Sobibor, Treblinka: The Operation Reinhard Death Camps (Indiana University Press, 1987), p. 51. Yitzhak Arad, Belzec, Sobibor, Treblinka: The Operation Reinhard Death Camps (Indiana University Press, 1987), p. 52. Raul Hilberg, editor. Documents of Destruction: Germany and Jewry 1933-1945 (Quadrangle Books, 1971), pp. 106-111. Stephen Potyondi, “Ziel Treblinka/’Final Destination Treblinka’” at https://ia600300.us.archive.org/12/items/ZielTreblinkafinalDestinationTreblinka/MicrosoftWord-Document1.pdf. See also John C. Zimmerman, Holocaust Denial: Demographics, Testimonies and Ideologies (University Press of America, 2000), p. 19 citing Janusz Gumkowski, Poland Under Nazi Occupation (Warsaw, 1961), pp. 64, 65.